I wanted to make a quick note to start the blogging back up again (yes, I know — don’t judge me!) by discussing a recent Digital Forensics Summit that took place during the first week of April here in the United States. 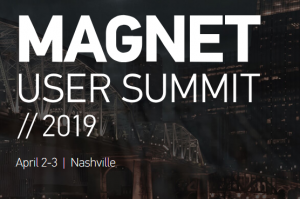 While there is some bias to this since both Devon and myself did present at the Summit, there is in no way, shape or form any endorsement or payment from Magnet for what I’m about to say here. This is just from little old me and only little old me! The Location of the event this year was in Nashville, TN, USA. Which during this time of the year is almost as majestic as it is tranquil. It is a site to behold if you’ve never been to this part of the country. It isn’t too hot that you’re sweating while in jeans and a polo, and it isn’t too cold that you need a large jacket to stay warm (weather permitting and region you’re probably from). What you’ll notice quickly is there is a great mesh of Midwest and Southern charm to the city. Strangers are friendly and there was not any time while out I felt as if I needed to be looking over my shoulder. This was all straight in the middle of downtown Nashville as well. Not like it was at an Airport Hilton 20 miles outside of it. Getting in and out of the airport is pretty seamless. A cab ride from the airport cost about $20 and took about 20 minutes to get to the hotel. The hotel was nearby the NHL arena and surrounded by electronic scooters that you could take anywhere…so long as the battery is charged up! The hotel was okay if I’m being honest. It was insanely overpriced in my opinion for an event of this nature, and was also missing much of the “Sheraton Vibes” as I call it. Those vibes are just the sense of luxury that has always been with the name. It also hurt a little when you looked out your window and saw a JW Marriott that as one of the other speakers mentioned, looked a lot like Stark Labs in Avengers. Staff was nice, bartenders were cordial. Food is plentiful and options are both creative and unique. If you’re a risk-taker with new options you will have a ton to choose from. If you want something that is more traditional to the area, you’ll find it in dang near every single place you go out to. Again, since the hotel was right in the heart of the city, you had more than enough options within walking distance. I went into this Summit not expecting a full on SANS DFIR Summit or even really a popular BSide like Augusta, Austin or even Las Vegas in size. Largely because this is much more tool/vendor specific and hence there is much more emphasis on what Magnet does and what they can do for you. I saw this because throughout the entire time I was there, I don’t think I saw one Magnet employee not engaged with an attendee or presenter asking what they can do. Everyone appeared to be happy to be there. That does say a lot to me about the event. Shows they care and they want to put on a good product for their customers. The presentations were staggered throughout the day with something I had not seen before during a Summit — LABS. What I feel I really took away from the event is they wanted to give people as much hands-on time with their tools as they could while sprinkling in some lectures to help stimulate the brain for potential new concepts they had not seen before. This goes against the grain seen in other conferences I’ve seen, where the lecture is front and center and the labs are something completely optional. Attendees appeared to be engaged with the lectures and everyone did genuinely appear to enjoy being there. It didn’t look too forced. Although, I’m also not sure how many were there from out of town and staying at the hotel or were those who were commuting into the conference daily since it was only a 2-day event instead of something that was a week long training. Lectures were diverse. Best way to put it. They had multiple panels from many different perspectives. And this felt like more of a combination with heavy emphasis on Law Enforcement with Private Sector/Consulting sprinkled in for good measure. From other conferences, it is almost completely opposite. If you plan on potentially presenting, remember your audience and make sure you can speak to them! This is where the hotel really killed them I think. While the conference itself is relatively tolerable, it is the hotel that could swing some folks to not want to attend, or being forced well outside of the area based on per diem rates. With the combination of Hotel + 1 Breakfast + 1 Dinner + 3 Adult Sodas I was flirting with what the overall cost to attend the conference was. Ya. That is pretty darn high. Even Vegas resorts were cheaper. They did provide lunch both days, unlimited coffee basically all day and some nice snacks. So it isn’t like it was all for naught. But if I’m on a strict training budget, it would be hard to probably keep it under what they would permit as “allowable,” especially if we are talking public sector employers. The rest of Nashville cost is about what you’re going to expect in a major city in the United States. Be prepared, or go find some fast food options if you’re going to be on a tight budget. What makes this event different than some of the others I’ve been to is they provided the attendees with multiple activities at any given hour to entertain them. If they had no intention on learning Powershell, they could walk into another room and learn about reversing iOS databases. That option can get lost in other events. I’m sure the attendees appreciates some leash on what they wanted to see as opposed to what the conference planners told them they should see. This is also one of the first conferences where I saw it more directly geared towards Digital Forensics and Investigations as opposed to the other phrase we always see: Digital Forensics and Incident Response. Not saying DFIR isn’t needed or that those events are bad, it is just a little more refreshing to see a vendor sponsored event that is even more niche than other conferences…and doesn’t care if you’re showing their tool or not (although I think most did). I saw great screenshots of Powershell and Python being used, so it can’t all be “USE THIS TOOL OR YOU’LL MISS THE SMOKING GUN! !” type language. That is refreshing to see, really. Finally, as mentioned before — if you have limited budget or just want something more low key than some of the larger ones…this isn’t a bad one to give an attempt and see if you like it or not. Not to mention Nashville the first week of April has some great perks if you’re just looking to get out of the office for a couple days and see something different!